Motorola Mobility and T-Mobile USA have announced the upcoming Motorola CLIQ 2 features both Android 2.2 Froyo operating systems and MOTOBLUR social connectivity, enabling the users to work and play hard with the business-ready features and robust entertainment options. 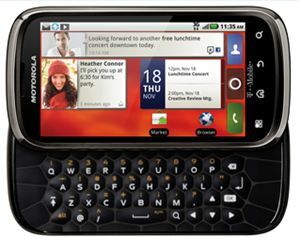 The power of the Motorola smartphone is boosted up by 1GHz processor. To increase the speed of text-messaging, the smartphone has been designed with a slide-out keypad. Featured with a 3.7-inch touchscreen display which operates at 854 x 480 resolutions, the Motorola CLIQ 2 is also equipped with a 5-megapixel camera with auto focus function. It also integrated with A-GPS, supports ActiveSync and 3G connectivity, has built-in stereo FM radio, USB 2.0 port, 512MB RAM, 3.5mm headphone jack and comes with a battery that provides up to 7.9 hours of talk time and 13 days of standby time. Moreover, it is Bluetooth enabled and supports microSD memory card. Available in a titanium hue with a smoke gray finish, the Motorola CLIQ 2 will be available exclusively to T-Mobile USA customers on Jan 19 at T-Mobile retail stores.